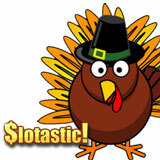 As my American friends prepare for Thanksgiving, one of the biggest holidays of the year, Slotastic Casino casino players are already giving thanks for some great Thanksgiving bonuses -- free spins, bonuses and double comp point weekends all through November. Get free spins on two of its most popular games, Hen House and Enchanted Garden, and receive casino bonuses just for playing the new Regal Riches or Naughty or Nice: Spring Break. Hen House has a built-in bonus game with free spins and win multipliers. You can get 30 free spins if you enter coupon code HEN30 as you m ake a deposit. Using coupon code 80ENCHANTED will get you 80 free spins on Enchanted Garden, a unicorn fantasy with a random jackpot currently about $4000 and several ways to win free spins. These free spins offers are available until November 30th. Play Regal Riches on November 5 and you can win 100 free spins. On the 13th, randomly selected Hen House players will receive a no-deposit bonus up to $250. Everyone playing Naughty or Nice Spring Break November 19th will be entered in a random prize draw awarding a choice of an up to $250 no-deposit bonuses or up to 50 Free Spins. Every weekend in November players enjoying designated games will receive double comp points. Check the casino’s Facebook page or in-game messages for details. Slotastic Casino has a great selection of online slot games, but don't forget it also has table games such as Blackjack. And Baccarat, Roulette and Casino Hold’em with live dealers.